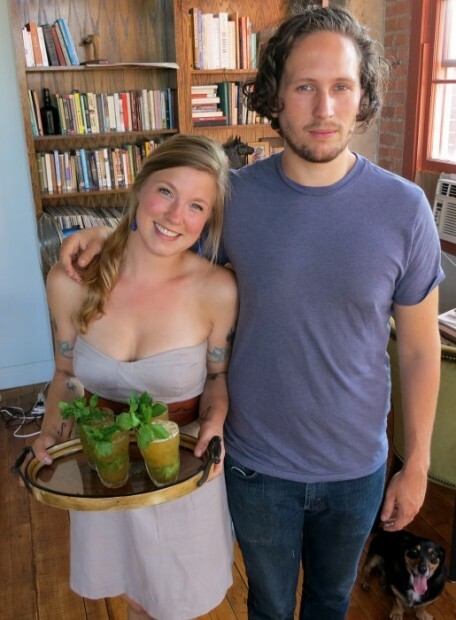 “When using mint, or any herb, in a cocktail, You NEVER want to break up a leaf – only express the oils,” said Lucy, as she gingerly pressed mint leaves against the glass with a muddler. My son Zan, and his partner, Lucy, invited me and Richard over for appetizers at their Detroit digs before our reservations at Roast. The highlight of this prelude to dinner was sampling another one of Lucy’s signature cocktails, and I hovered next to her as she prepared our libation. Lucy tells me it’s far preferable to smoke the peaches over wood chips, but if a wood-burning grill is not available to you, omit the grilling part and simply proceed with the recipe using ripe, peeled peaches. “I’m going for flavors that complement the bourbon, wrapped in a minty finish,” she said. Sure, you have to fuss when making a swishy cocktail such as this. But it certainly set a festive mood before we proceeded to dinner at the much applauded Roast, located on the corner of Washington Boulevard and State Street in the Westin Book Cadillac building. On the drive to Roast, we passed a field of scrap metal, twisted and sculpted as a people, faces lifted to the sky; then, a blur of street art splashed upon crumbling walls, as fine as any museum piece – open air galleries of unbridled talent. Wrapped in dusk’s patina, we admired the ornate architecture of the church next to the restaurant, illuminated by a canopy of urban twinkle lights: a city of dreams, a city on the edge, a city anxious to be reborn. 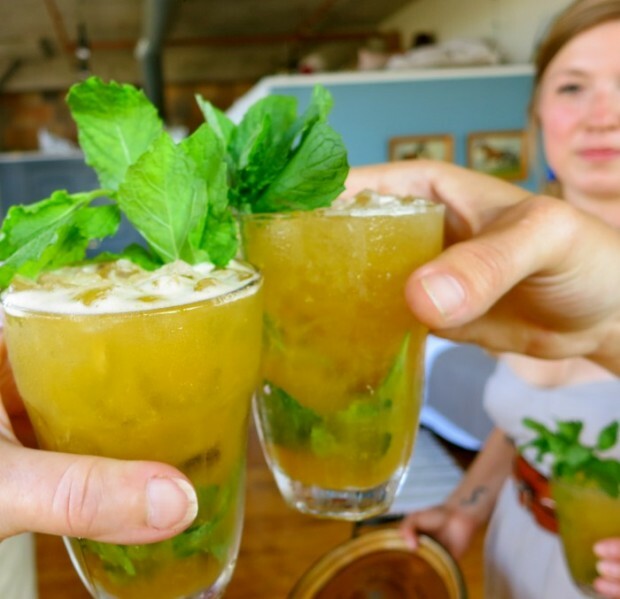 Place the mint leaves in a julep cup, or any glass or tumbler that accommodates 6-8 ounces. Gently press them in the bottom of the cup with a spoon or muddler, taking care not to break a leaf. Pour bourbon and syrup into glass and top with a small amount of ice cubes or crushed ice to fill glass 3/4 of the way full. Stir gently until the outside of cup is frosty. Top with additional ice. If using shaved ice, pack down to give it a bit of a snow cone effect. Slap the mint garnish against your arm to extract the oils, and place in glass.If you’ve created a snow cone effect, serve with straws for easier sipping. Prepare charcoal grill to high heat. Place peach halves, face down, on cleaned and oiled grill grates and char. Using prongs, turn peaches over then toss hickory chips through grates over coals. Close lid to trap the smoke. Cook peaches until just falling apart and remove. While peaches are hot, place in food processor with 2 ounces of simple syrup and puree. Add additional simple syrup to taste. (Note: it should be sweet, but not overly sugary.) Strain mixture through a mesh strainer and cool. *A simple syrup may be made by combining equal parts white sugar and water in a saucepan. Bring to a boil to dissolve sugar, remove from heat and chill. Maple syrup or Demerara sugar may be substituted for the simple syrup.